Home / News / EHF / Women’s EHF CL (1/2 Final): Buducnost wins in Norway! Women’s EHF CL (1/2 Final): Buducnost wins in Norway! HC Buducnost Podgorica is for the first time very close to the Women’s EHF Champions League Final after win in Norway against Larvik 22:20 (12:12). Larvik – Arena Larvik. Spectators: 2.700. Referees: Badura i Ondogrekula (Slovakia). 7 meter: Larvik 5 (5), Budućnost 7 (7). Exclusions: Larvik 4, Budućnost 12 minutes. 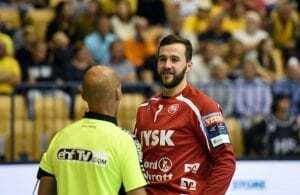 Larvik: Rantala, LEGANGER (15 saves), Larsen 1, BLANKO 3, KRISTIJANSEN, JOHANSEN 1, BREJVANG 2, N. Merk, RIGELHUT-KOREN 8 (5), SULAND 4, Medvedeva, T. Merk, Vibe, Kurtović 1. Budućnost: VOLTERING (16 saves), Barjaktarović, Vukčević, MILJANIĆ 1, Đokić 1, Radović 1, A. BULATOVIĆ 1, SAVIĆ 1, Jovetić 2, POPOVIĆ 6 (3), K. BULATOVIĆ 6 (4), CVIJIĆ 2, Mehmedović, Gjorgijevska, Knežević 1, Lazović. Next Story → Slovenia: Gorenje close to the tile after win in Koper!